Grande: I finished Miriam Felton's Gable Mitts and I am very happy with them! They fit snugly and I can drive, knit or do almost anything else while wearing them. Brewing: Dalya's Skull Hat. The pattern is charted, and I want to cast this on, but I need to finish something first (self imposed rule!). Brewing idea: Do you want to join a Learn-Along? A big project that we can investigate and learn about together? I'm open to your suggestions. I muse a bit about the meditative and other healing qualities of knitting, and reference a talk by Stephanie Pearl McPhee called This is Your Brain on Knitting. You can read a gloss of the talk here. Double Steal/Purloined/Flavor of the Day: I talk about what knitwear I have actually been wearing, as well as considering what I can learn from what gets worn and what does not get worn. What are you wearing? I'm particularly fond of wearing my Vine Yoke Cardigan and my Cassidy, as well as many, many hand knit socks. As a scarf, I've found the Clapotis to be very versatile. Taste: I review The Bag Making Bible by Lisa Lam, a beautiful book that can teach you many, many sewing techniques while you make spectacular bags. Tip Jar: Turn narrow sewn tubes using the technique used by cloth doll makers. You can see it demonstrated here. It is very different than the usual technique of pulling the fabric either through a tube or back on itself. With this technique, you put very little stress on your fabric tube, and it turns quite easily. Be careful not to use the tubes as they are demonstrated here. Remember, roll the fabric gently up the "stick" to turn it, don't pull! Second tip: Make your daily To-Do list no more than three items long. Try it and see how much more you get done. Latte: I am almost done with the Gable Mitts by Miriam Felton. 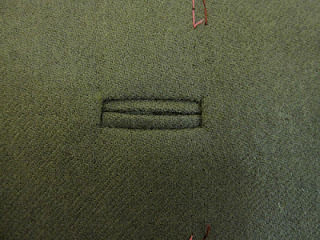 The double start double cast on gives a beautiful edge, almost like tiny picots. Chai: Shattuck Avenue in Berkeley has some beautiful old movie theaters. If you go don't just watch the show, check out the decor! In Oakland, I discovered Piedmont Yarn and Apparel, a beautiful shop that sells yarn, spinning fiber and also rents out knitting DVDs. It's a friendly place, and they have a knitting group on Wednesdays and Fridays from 3pm to 7pm. Events: I will be at Madrona from February 14 through the 17th and would love to meet you! Stay tuned for podcaster meet up info. I tell a Sewing Story. 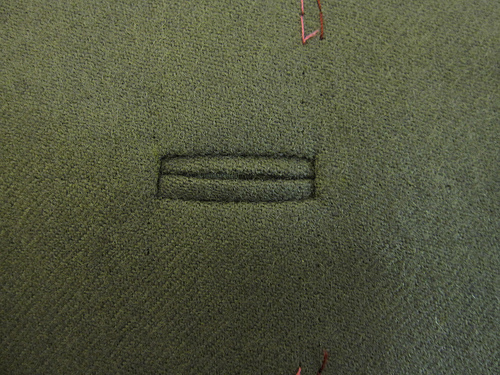 If you're curious about bound buttonholes, look here. Sofa: I've been going to the movies, and share my impressions of Les Miserables, Cirque du Soleil, Life of Pi and Argo. Caffeinated: I'm excited about two things this week: Clarins UV Plus HP Ecran Multi-Protection SPF40 and an app, Calibre Library. Latte: Abby has been working on Brenda Petipa's Tribute Socks and also Miriam Felton's Gable Mitts from the Twist and Knit collection. Bitter Cup: Brickletown Mitts went very badly, and somehow Odelia's sleeves had the wrong number of stitches. (Sigh.) 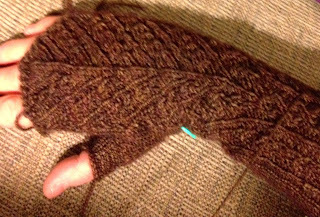 Frogged the mitts, reuniting the sleeves. Also, Abby's Bernina had apparently been dropped somewhere between New York and California and has required something more than just a little TLC to get working properly again. Brewing: Abby learns -- again -- that she is NOT a project knitter! Abby also confesses that she was wrong - you CAN have too many projects on your needles. Sofa: Abby speaks of the merits of coming "late to the game" and recounts the many things she missed the first time around, including: Star Trek, Buffy the Vampire Slayer, Homeland, The Artist and the Mary Russell novels of Laurie R. King. Claire Danes is wonderful, and if you haven't seen My So Called Life or Temple Grandin, they are highly recommended. The "hero/heroine who is always right but never believed" is a theme in both Homeland as well as in Psych. Abby also talks about one of her very favorite shows, Bunheads. Bunheads trivia: check out Kelly Bishop here!